John McTigue sets Kuno Creative apart from other agencies by digging deeper into his prospect’s data. At the end of 2016, Kuno Creative wanted to uncover the factors that separated profitable clients from unprofitable ones. Even though they had plenty of contacts in this industry from 17 years in business, John realized they would need to try a different approach to sales and marketing if they wanted to close more of their ideal customers. Other digital agencies were also eager for this business and would likely try to undercut them on price. “We did not want to start the relationship by giving standard recommendations like, ‘you should implement more lead forms’ or other tips usually offered in a consultation from other HubSpot partners,” said John. John wanted to show these prospects that Kuno was uniquely qualified to solve their problems. So, he started using tactics from account-based marketing and sales. A target account-based approach focuses on clients with greater upfront and lifetime value. This allowed him to justify the increased time spent on each prospect. John wanted to show that nobody could match the value provided by Kuno. John had already worked with a holding company that owned many of his top prospect accounts. From the past work, he knew that many brands only had one digital strategy manager and a very small team. They were significantly understaffed for the challenges associated with executing a full digital marketing strategy. To get face-time with key leaders from his target accounts, Kuno was invited to an internal marketing strategy conference held by the holding company. Since he would need to eventually get approval from 10-12 people on each account, this personal outreach set the tone for the rest of the pursuit. John also executed a full digital content marketing strategy to reach these twenty accounts. But, he did it in a very focused way. For example, the blog team helped him write about topics relevant to these 20 accounts, like this one on channel sales. And despite being one of the top agency partners of a marketing automation platform (HubSpot), they resisted the urge to do any sort of templated lead nurturing. Instead, they manually sent highly targeted content to specific leaders at their 20 prospective accounts. They also did some ad re-targeting to reach these people through as many channels as possible. All of this effort- shaking hands, blogging, ad retargeting etc.- came before sitting down to discuss how they could help. But by then, Kuno had already proven their experience in the exact places where the prospect required help. Now, they needed to demonstrate they could employ the same tactics and have the same results for the prospect’s funnel. Kuno does an extensive review of the client’s marketing data within services like Google Analytics, Google AdWords and HubSpot Marketing/CRM. They look at opportunities around all parts of the funnel, but they need to make a quick judgement on which changes should be highest priority. They communicate their suggestions through 1-click dashboards, like the Pipeline Performance Dashboard shown below. 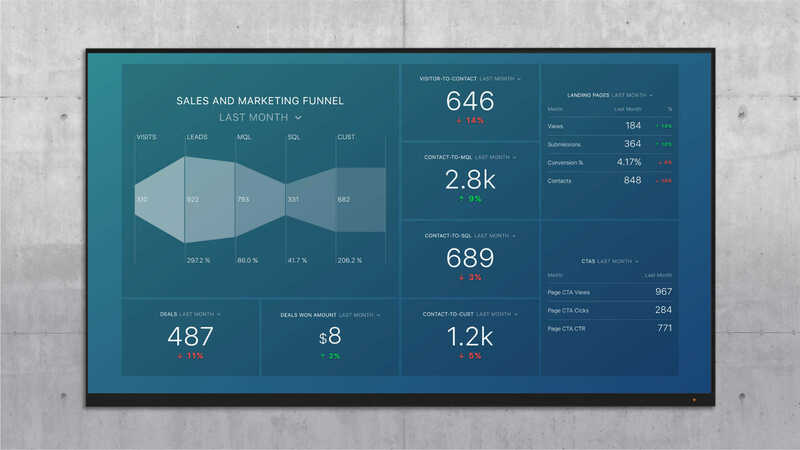 Kuno Creative uses Databox to augment their KPI monitoring and client reporting processes and therefore, has created templates they can quickly use with a new prospect during a pursuit. The visuals like the one above allow them to easily explain why they recommend specific actions. For example, instead of generically explaining the ways they have improved funnel conversion rates for past clients, they can suggest ways to improve this specific conversion rates for the prospect. While it may seem like Kuno did a bunch of work before even writing a proposal, it is all work they’ve done before. They’ve been committed to content marketing for years, so the blogging was not much extra effort. They’ve been proactively reaching out to leads for years too, with staff dedicated to it. As mentioned above, they also leveraged their newly-streamlined agency reporting process to efficiency do the audit. Lastly, they aren’t too eager to do proposals to these clients. While they’ve completed four audits since implementing this new process in the beginning of the year, they’ve only committed to writing one proposal. That doesn’t mean they didn’t talk about next steps with the other four, or that any of them are not moving forward. Ready to Use Data in Your Agency’s Sales Process? If your agency struggles to differentiate its services, you might want to repeat Kuno’s exercise by evaluating the characteristics of your best clients and pursuing them in a targeted way. While you may end up putting in more marketing and sales effort to personalize your approach to these target accounts, it will help you differentiate your agency from the pack. According to our survey data, 30% of agencies insist on access to a prospect’s data before proposing anything. Maybe it’s time you use data more frequently in your sales process?